Lance is two years old today! He loves fire trucks so we planned a birthday visit to a station. All the pictures are on my sister’s camera so this will have to do until I can get them from her. Lance is an incredible little man. He has a strong sense of how things should be and constantly goes about arranging his little world just so. He tries hard to do whatever strikes his fancy and gets frustrated if things don’t work like they should. He has winning smile that makes my day and an out-going personality that instantly wins friends. He loves his baby sister and can burst out in spontaneous laughter in order to make her laugh. Physically, Lance is still a little guy, just now fitting into size 12 month clothes, but his size doesn’t hold him back, he just figures out creative ways to do what the big kids do. He has a limited range of foods he likes, his top favorites being peanut butter, strawberry yogurt and cheese. He refuses to try anything that Ivy eats – not even cheerios. He likes to be clean and will ask for a rag part way through his meal so he can wipe his hands. He likes to read books with Mom and wrestle with Dad. He can set the table, pick up his toys, wipe up a spill and LOVES to help mommy cook – he even helped with his own birthday cake. It has been so much fun watching him grow and learn and develop. 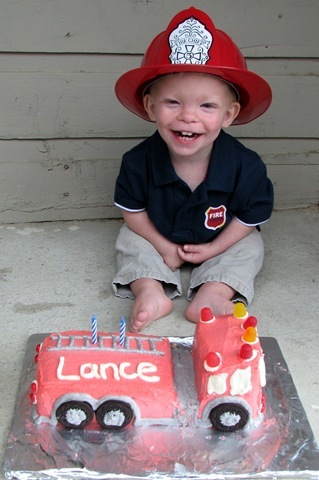 We are so grateful God gave us this gift – our little helper, Lance.